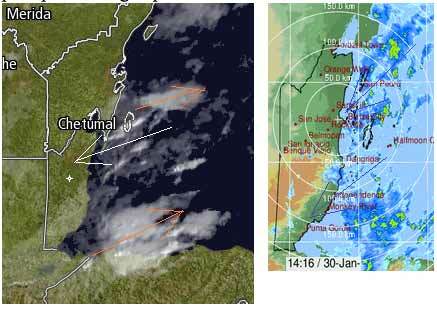 Belize NMS: Cold front affecting the country and maintains windy, cool and relatively moist conditions. 24-hour forecast: Variably cloudy and cool with a few showers, periods of rain and isolated thunderstorms mostly over the sea and along southern and some coastal areas. General Outlook: Variably cloudy, windy and cool with little or no rainfall during Wed. then a few showers or periods of rain mostly over southern and some coastal areas Wed. night. Today N-NE 12-25 kts Rough 5-7 ft A FEW SHOWERS, PERIODS OF RAIN AND ISOLATED THUNDERSTORMS. Tonight N-NE 15-25 kts Rough 5-8 ft A FEW SHOWERS OR PERIODS OF RAIN MOSTLY SOUTH. Tomorrow N-NE 10-20 kts Rough 5-7 ft ISOLATED SHOWERS OR PERIODS OF LIGHT RAIN MOSTLY SOUTH. Outlook N-NE 10-20 kts Moderate-Rough 4-7 ft A FEW SHOWERS OR PERIODS OF RAIN. 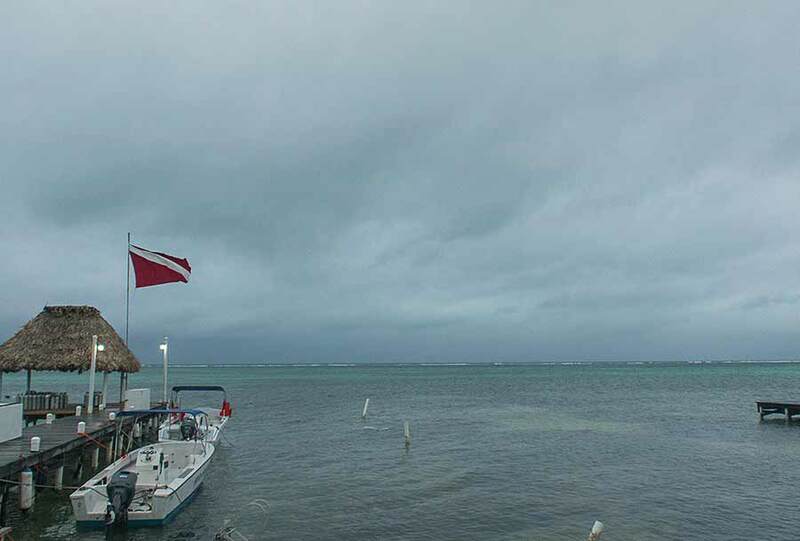 On Ambergris caye this morning the wind is from the North at 10 mph and the sea state is rough. We have a heavy overcast sky and rain. 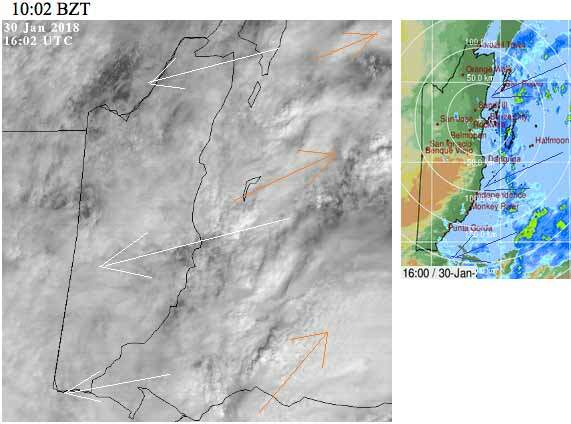 The expected high is 75 f.
There is a lot of cloud around, both low level Caribbean winds from the ENE covering all of Belize and there is significant high level SW cloud. Together they are causing a lot of rain right now, but most of that is just off shore and much of Toledo district and a bit in Stann Creak. The Rain in Toledo has eased up in the last hour. There is this morning, for the first time in many days, a hint of SW "Tiger" wind, does that mean the weather is starting to change. 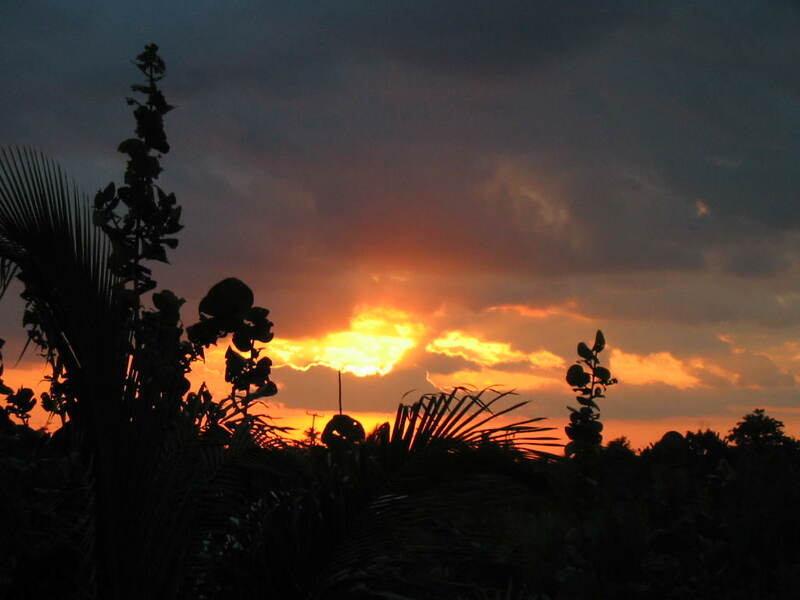 Looks like today will again be mainly cloudy, most rain out at sea, but scattered on land, perhaps the odd glimps of sun later. 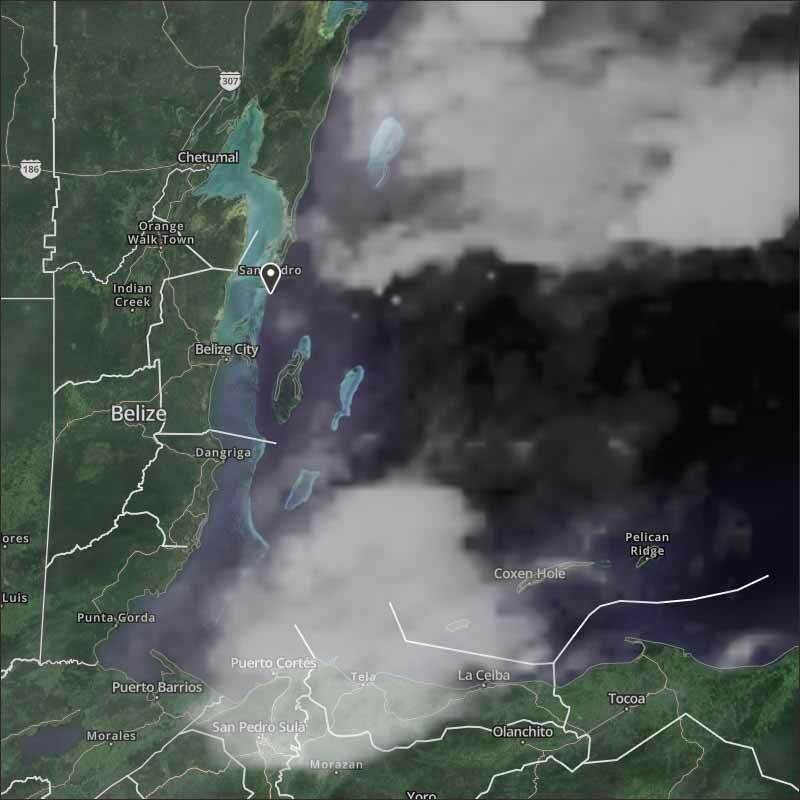 The Cloud picture: Thick Caribbean cloud cover over all Belize, but the high level cloud only causing significant rain out at sea. Lotta rain in San Pedro.